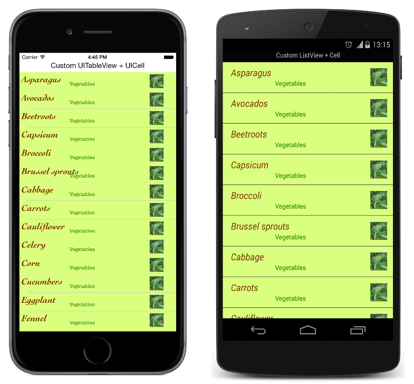 A Xamarin.Forms ListView is a view that displays a collection of data as a vertical list. This article demonstrates how to create a custom renderer that encapsulates platform-specific list controls and native cell layouts, allowing more control over native list control performance. Every Xamarin.Forms view has an accompanying renderer for each platform that creates an instance of a native control. When a ListView is rendered by a Xamarin.Forms application, in iOS the ListViewRenderer class is instantiated, which in turn instantiates a native UITableView control. On the Android platform, the ListViewRenderer class instantiates a native ListView control. On the Universal Windows Platform (UWP), the ListViewRenderer class instantiates a native ListView control. For more information about the renderer and native control classes that Xamarin.Forms controls map to, see Renderer Base Classes and Native Controls. Create a Xamarin.Forms custom control. Consume the custom control from Xamarin.Forms. Create the custom renderer for the control on each platform. Each item will now be discussed in turn, to implement a NativeListView renderer that takes advantage of platform-specific list controls and native cell layouts. This scenario is useful when porting an existing native app that contains list and cell code that can be re-used. In addition, it allows detailed customization of list control features that can affect performance, such as data virtualization. The NativeListView is created in the .NET Standard library project and defines the API for the custom control. This control exposes an Items property that is used for populating the ListView with data, and which can be data bound to for display purposes. It also exposes an ItemSelected event that will be fired whenever an item is selected in a platform-specific native list control. For more information about data binding, see Data Binding Basics. The NativeListView custom control uses platform-specific custom renderers to display a list of data, which is populated through the Items property. Each row in the list contains three items of data – a name, a category, and an image filename. The layout of each row in the list is defined by the platform-specific custom renderer. Because the NativeListView custom control will be rendered using platform-specific list controls that include scrolling ability, the custom control should not be hosted in scrollable layout controls such as the ScrollView. A custom renderer can now be added to each application project to create platform-specific list controls and native cell layouts. Create a subclass of the ListViewRenderer class that renders the custom control. Override the OnElementChanged method that renders the custom control and write logic to customize it. This method is called when the corresponding Xamarin.Forms ListView is created. It is optional to provide a custom renderer in each platform project. If a custom renderer isn't registered, then the default renderer for the cell's base class will be used. The ListViewRenderer class exposes the OnElementChanged method, which is called when the Xamarin.Forms custom control is created to render the corresponding native control. This method takes an ElementChangedEventArgs parameter, that contains OldElement and NewElement properties. These properties represent the Xamarin.Forms element that the renderer was attached to, and the Xamarin.Forms element that the renderer is attached to, respectively. In the sample application, the OldElement property will be null and the NewElement property will contain a reference to the NativeListView instance. An overridden version of the OnElementChanged method, in each platform-specific renderer class, is the place to perform the native control customization. A typed reference to the native control being used on the platform can be accessed through the Control property. In addition, a reference to the Xamarin.Forms control that's being rendered can be obtained through the Element property. The native control should only be configured and event handlers subscribed to when the custom renderer is attached to a new Xamarin.Forms element. Similarly, any event handlers that were subscribed to should be unsubscribed from only when the element the renderer is attached to changes. Adopting this approach will help to create a custom renderer that doesn't suffer from memory leaks. An overridden version of the OnElementPropertyChanged method, in each platform-specific renderer class, is the place to respond to bindable property changes on the Xamarin.Forms custom control. A check for the property that's changed should always be made, as this override can be called many times. The following sections discuss the implementation of each platform-specific custom renderer class. This method creates a NativeiOSListViewCell instance for each row of data that will be displayed on the screen. The NativeiOSCell instance defines the layout of each cell and the cell's data. When a cell disappears from the screen due to scrolling, the cell will be made available for reuse. This avoids wasting memory by ensuring that there are only NativeiOSCell instances for the data being displayed on the screen, rather than all of the data in the list. For more information about cell reuse, see Cell Reuse. The GetCell method also reads the ImageFilename property of each row of data, provided that it exists, and reads the image and stores it as a UIImage instance, before updating the NativeiOSListViewCell instance with the data (name, category, and image) for the row. This class defines the controls used to render the cell's contents, and their layout. The NativeiOSListViewCell constructor creates instances of UILabel and UIImageView controls, and initializes their appearance. These controls are used to display each row's data, with the UpdateCell method being used to set this data on the UILabel and UIImageView instances. The location of these instances is set by the overridden LayoutSubviews method, by specifying their coordinates within the cell. The method creates a new instance of the NativeiOSListViewSource class that provides data to the UITableView control, provided that the bindable NativeListView.Items property has changed. The native ListView control is configured provided that the custom renderer is attached to a new Xamarin.Forms element. This configuration involves creating an instance of the NativeAndroidListViewAdapter class that provides data to the native ListView control, and registering an event handler to process the ItemClick event. In turn, this handler will invoke the ItemSelected event provided by the NativeListView custom control. The ItemClick event is unsubscribed from if the Xamarin.Forms element the renderer is attached to changes. The GetView method is called to return the cell to be rendered, as a View, for each row of data in the list. It creates a View instance for each row of data that will be displayed on the screen, with the appearance of the View instance being defined in a layout file. When a cell disappears from the screen due to scrolling, the cell will be made available for reuse. This avoids wasting memory by ensuring that there are only View instances for the data being displayed on the screen, rather than all of the data in the list. For more information about view reuse, see Row View Re-use. The GetView method also populates the View instance with data, including reading the image data from the filename specified in the ImageFilename property. This layout specifies that two TextView controls and an ImageView control are used to display the cell's content. The two TextView controls are vertically oriented within a LinearLayout control, with all the controls being contained within a RelativeLayout. The method creates a new instance of the NativeAndroidListViewAdapter class that provides data to the native ListView control, provided that the bindable NativeListView.Items property has changed. The native ListView control is configured provided that the custom renderer is attached to a new Xamarin.Forms element. This configuration involves setting how the native ListView control will respond to items being selected, populating the data displayed by the control, defining the appearance and contents of each cell, and registering an event handler to process the SelectionChanged event. In turn, this handler will invoke the ItemSelected event provided by the NativeListView custom control. The SelectionChanged event is unsubscribed from if the Xamarin.Forms element the renderer is attached to changes. The DataTemplate specifies the controls used to display the contents of the cell, and their layout and appearance. Two TextBlock controls and an Image control are used to display the cell's content through data binding. In addition, an instance of the ConcatImageExtensionConverter is used to concatenate the .jpg file extension to each image file name. This ensures that the Image control can load and render the image when it's Source property is set. The method re-populates the native ListView control with the changed data, provided that the bindable NativeListView.Items property has changed. This article has demonstrated how to create a custom renderer that encapsulates platform-specific list controls and native cell layouts, allowing more control over native list control performance.